Randy Boissonnault MP (born July 14, 1970) is a Canadian politician, who was elected to represent the riding of Edmonton Centre as a Liberal member of the House of Commons of Canada in the 2015 federal election. He is one of five openly LGBT MPs serving in the 42nd Canadian Parliament, alongside Rob Oliphant, Seamus O'Regan, Randall Garrison and Sheri Benson. He is also the first openly gay MP elected in Alberta. Boissonnault was born in the Franco-Albertan town of Morinville, Alberta on July 14, 1970. After graduating from the University of Alberta, Boissonault studied at the University of Oxford as a Rhodes Scholar. He subsequently worked as a lecturer at the University of Alberta’s Campus Saint-Jean and as a journalist and political commentator for Radio-Canada and Les Affaires. 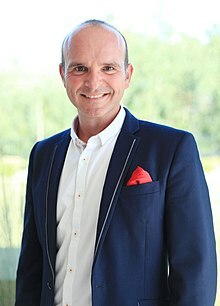 Boissonnault was elected in the 2015 election in the riding of Edmonton Centre, the first Liberal MP to win in the riding for almost a decade. Upon being sworn in as a Member of Parliament, Boissonnault was named Parliamentary Secretary to the Minister of Canadian Heritage. On November 15, 2016 Boissonnault was named special advisor on LGBTQ2 issues to the Prime Minister. The role will involve advising Trudeau "on the development and co-ordination of the Government of Canada’s LGBTQ2 agenda" including protecting LGBT rights in Canada and addressing both present and historical discrimination. ^ "Hedy Fry wins decisively as Liberals sweep Canada for majority". Daily Xtra, October 20, 2015. ^ a b c d Estabrooks, Trisha (May 2016). "A Force of Nature: From Morinville to Oxford to Ottawa, Randy Boissonnault hasn't let anything stand in the way of getting what he wants". Avenue Edmonton. Retrieved November 3, 2017. ^ a b "Feds name gay MP as ‘LGBTQ2 issues’ advisor". Daily Xtra, November 15, 2016. ^ "October 19, 2015 Election Results — Edmonton Centre (Validated results)". Elections Canada. October 23, 2015. Retrieved November 4, 2015.